I am FINALLY big and strong enough to sit in a Bumbo Seat! What’s that, you ask? It’s a cool foam seat that holds me up, so that I can see the world in a whole new light! I mean, as advanced as I am, I still can’t sit up by myself (duh, people…I AM only 3 months old! Geesh, you have such HIGH expectations!) But I can chill here in my Bumbo, and it will help me to figure out this whole “sit up” thing. Right now, I’m just confusing “SIT up” with “SPIT up”, but give me time folks, give me time…. 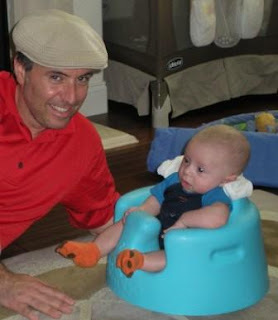 My Uncle Harvey, Aunt Teri, and Cousin Aaron were SO nice to buy this Bumbo for me! They also bought me a tray that fits on top, because of course I need a way to hold on to my stuff! 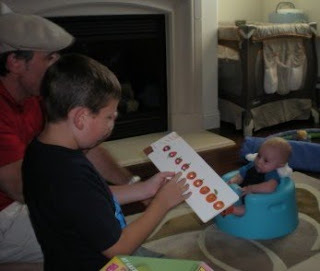 Then Aaron helped me test out my seat, by reading me his very favorite book, ‘The Very Hungry Caterpillar’. A big thank you to my A-Z family!!!! !